diy investor (uk): One Million Pageviews for the Blog! 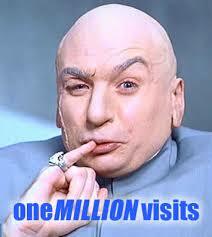 Well, here we are...1 million people have visited the blog over the past 6 years...whodathoughtit! If I had £1 for each visit I would be doing well...ha ha. During this period I have posted a total of 447 articles which attracted over 1,000 comments. Looking back, it is striking just how much my investing journey has moved around. Partly this has been influenced by reflecting on the input of readers, partly from changing circumstances such as the recent transition to State pension and also a fair share of poor decisions resulting from good old irrational thinking. In the early days, my investing strategy was all about generating natural income from a mix of high-yielding UK shares and a basket of mainly UK-focussed investment trusts. My target income was 4% of my combined SIPP and ISA investments with the intention to reinvest any surplus. This had worked just fine since I decided to move to early retirement in 2008 at age 55 yrs. At some point in 2014/15 I was beginning to take a closer look at this strategy and came to the conclusion that the focus on high income shares and trusts was limiting my investing horizon. For example, I had ignored the option of low cost global index funds such as Vanguard Lifestrategy because the yield was only 1.4%. "Individual shares have been interesting but they are volatile and I have not noticed any greater return to my portfolio for the additional risk so I will wind down the rest of my shares portfolio in the coming months and move the proceeds into collectives". Today, I am looking to preserve what I have accumulated with my core of multi-asset global index funds and also look to the future with some of my technology and 'green' investments. Of course, the blog has been a useful platform to showcase my books. The first was "DIY Introduction to Personal Finance" self published in February 2012, a year before I started this blog. It was followed by "DIY Pensions" which is by far the most purchased title with just over 60% of sales (ebook & paperback combined), then "DIY Income" in 2014 and finally my second most popular seller "DIY Simple Investing" published in 2015 which accounts for 20% of the total. I hope I can shed a little light on the mysteries of the self-directed investing process and help readers to take more responsibility for their future financial well-being. The main purpose of starting the blog was to keep a journal of my investing journey. Some of the articles are obviously more interesting to readers than others. The ones that have attracted most attention are usually when they are mentioned in a link by Monevator! In April 2015, I had been thinking about a more globally diverse strategy and wrote "VanguardLifestrategy - A One-Stop Solution". This subsequently morphed into the concept of "DIY Simple Investing" and for which I wrote this guest post on Monevator. Asset allocation is an important aspect of the investing process. The better returns will most likely come from holding investments over many years so it's important for the DIY investor to find a strategy which will enable him/her to stay in the game for the long term, particularly during periods of volatility as we have experienced in recent months. This revised article on the subject was written in May 2016. Just a few of the most read articles over the years - more are listed under the 'popular posts' tab above. So, I am about to enter my 7th year with the blog. I'm not sure if I will manage to get to two million pageviews but will carry on a while longer. When I started out there were not too many investing bloggers around - Monevator and Retirement Investing Today spring to mind from the UK. Today there are lots more which is good to see. Many thanks to all the people out there who dip in from time to time to share the journey and especially for many of the comment which have given me much food for thought as well as an opportunity to reflect on many of the mistakes I have made along the way. Finally, an apology to those who really do not care to read about Brexit or Climate Change. Hopefully, the former can be put to bed before very much longer (?) but I have five grandchildren so the latter is likely to increasingly influence my thinking and also my investing decisions. "Nothing less than our future and the fate of humankind depends on how we rise to the climate challenge"
Your site always provides an interesting take on investing. Congrats on the 1m milestone and please keep up the great work you do. I seem to have followed a similar path away from shares to ITs, so although I only discovered your blog relatively recently it's been fascinting reading for me. Interesting to see you too have given up on the individual shares. I would be interested to learn about the process that drew you to that course - maybe you could expand on your blog at some point? I never ran the precise numbers, but I reckoned my investment trusts did as well and perhaps even a little better than the shares I held, and with a lot less volatility of course. I may still dabble at some point in a few years time, if time allows and something appears especially attractive! Congratulations on this milestoe, DIY! I have forwarded your Vanguard Lifestrategy - A One-Stop Solution to a couple of friends who expressed an interested in wanting to start investing. No idea if they ever did anything or even read it but if I didn't have a clue about investments, that post would have very likely gotten me into investing. Your blog helped put me on the path of investment trusts and for that I thank you as I can see them being a part of my portfolio for a while yet. Cheers weenie. Yes VLS is a good entry point for anyone starting out. Once you have sorted your asset mix, it is very straight forward. I also like investment trusts to provide a little extra such as Scottish Mortgage for exposure to technology and more recently Impax Environmental Markets. As for keeping this going to reach two million...I am not so sure! One day/week/month at a time. Thank you for all you've shared. You too have got me into investments trusts, more specifically Scottish Mortgage. I always find your posts very informative. Thank you and keep going! Thanks CC and hope SMT works out for you. Likewise, keep going!